Back in the 1980's Richard Simmons developed a way for people who were trying to lose weight to keep better track of what foods they were eating. He developed the Deal-A-Meal cards based on the American Dietetic Association's diabetic exchange program. The plan was simple, see how much weight you needed to lose, chose the appropriate amount of calories you are allowed daily, and keep track of the food eaten by moving colored cards from one side of a wallet to the other. Deal-A-Meal is a weight loss program that helps you lose weight by teaching you to eat the proper types of food in the correct portions. That's it. There are no magic formulas, no pills, no 'lose weight in your sleep' misconceptions. 1. It teaches you good eating habits. 2. It emphasizes the importance of exercise. 3. It promotes a positive mental attitude. Deal-A-Meal requires one thing: Willpower. You must have the ability to make decisions for yourself and learn to say 'NO'. You can succees at Deal-A-Meal if you are committed to sticking with it and making it a permanent part of your life. The Deal-A-Meal "My Contract With Myself"
This contract is to be filled out before you start on the Deal-A-Meal program. It's a promise to yourself of how much weight you want to lose and *why* you want to lose it. 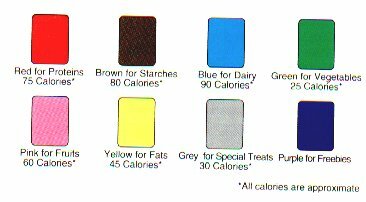 The FoodMover included with the Move, Groove & Lose and the Lose Weight and Celebrate programs works on the same basis of the Deal-A-Meal cards, but instead of a wallet with cards it's all in a nice self-contained plastic box small enough to fit in a purse. It has a few items not included with the cards, though, like slides for daily water intake, vitamin, exercise, and for a few inspirational sayings from the Project Me series. Note: The calorie allowances in the newer FoodMover program allows more calories than the old Deal-A-Meal!! But *WHAT* Can I Eat, Really? 1. Exercise, especially aerobic exercise, strengthens your heart and reduces your size and weight by burning fat. 2. Exercise supresses your appetite for thirty minutes to one hour. 3. Exercise may increase your lifespan. 4. Exercise may eliminate depression. 5. Exercise loosens you up, reducing tension and increasing flexibility. 6. Exercise reduces stress and can alleviate stress-related problems. 7. Exercise increases your energy level. 8. Exercise sharpens and quickens your mind because of the extra oxygen flowing through your head. 9. Exercise helps you sleep better. 10. Exercise makes visits to the bathroom more regular. 11. Exercise cleans out your lungs, increasing their capacity and eliminating that "out-of-breath" feeling. 12. Exercise makes you more conscious of your body and posture. 13. Exercise builds up your resistance to sickness. 14. Exercise will improve every aspect of your appearance. It will tone, shape, and firm you into a more attractive person. 15. Exercise motivates you to tackle other challanges and to succeed. The energy you've created through exercising will beneficially affect other parts of your life. More information on the FoodMover can be found at SuzyBear's Move, Groove & Lose Page or the "At Home With Richard Simmons" web site, along with ordering information. Richard says Deal-A-Meal cards are no longer available. 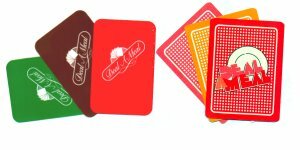 Deal-A-Meal cards are Copyright © Deal-A-Meal Corp. I have no affiliation with the company other than being a satisfied customer.